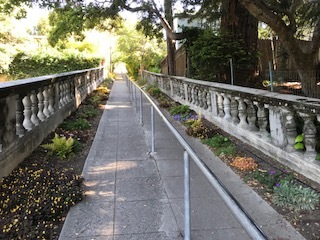 Friends and neighbors: Just thought we’d share a look at historic Fountain Walk as the plantings lovingly maintained by FOFW Friend and walk neighbor Wendy Wells are springing into bloom. If you are out for a walk in Northbrae, make sure to take in the walk. In case you’re not sure where it is: It runs up along the eastern side of the Solano Tunnel, beginning at the corner of Sutter and Del Norte with a set of steps that lead to a path that ends a block or so later at The Circle, the home of the fountain. Go to the Fountain tab on our home page to learn more. And while you are on the home page, consider joining Friends of the Fountain and Walk. It’s free and a great way to show your support for FOFW and our neighborhood landmarks. Just click on the Join tab. Happy spring from all of us at FOFW! It looks lovely and must be a constant source of joy for those living around the circle.